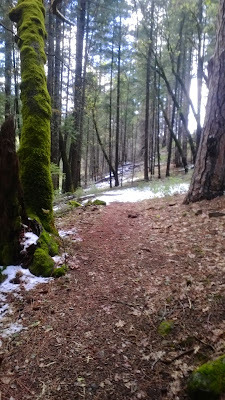 After a spring storm I was reluctant to go out for the trout opener. The weather went from 80 degrees to 60 degrees within a day and I had mix feelings about how the fishing would be. But seeing as I had an open schedule, I decide to get out there on one of my favorite streams. This was my first time fishing around snow and I was thrilled to see how beautiful everything was. One of the easiest and closest streams to fish for trout in Chico during the trout season, Deer Creek is a stream that is more quantity than quality but I do catch a few big ones here and there. You can catch an endless amount of small trout there within a few hours. They will rise to a lot of dries and will take a lot of different nymphs. A fantastic place to practice fly fishing with a 2wt or 3wt. There are also steelhead in certain areas of the creek in the spring and fall as well as salmon that run during the fall as it is one of the few streams in California without any barriers. I fished the barbless artificial section of the creek which is generally the most fly fishing friendly area. 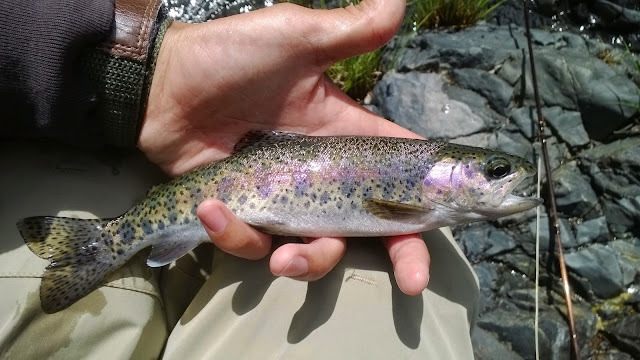 I caught a bunch of trout on size 14 & 16 general nymphs and a 14 Adams dry fly when the hatches were coming off. Great place to get away from the world and catch some fish. I'll be chasing carp for the rest of the week as the weather is suppose to be around 90 degrees the rest of the week. Summer preview! I have heard a lot about deer creek but have yet to visit. hopefully soon! Thanks for the report! It great. You once you get past the red bridge, the creek literally is side-by-side with HWY 32 all the way up to Chester. Lots of spots to fish.